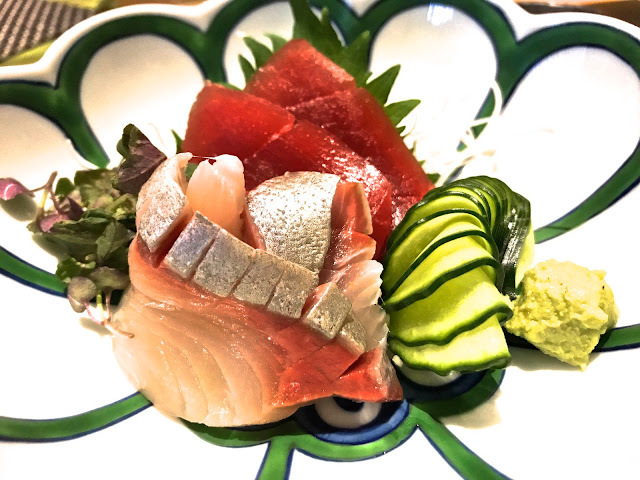 Recently I was invited to take a culinary tour of the San Francisco Bay Area. That meant exploring Oakland, San Francisco and San Jose eating, drinking and meeting chefs. The restaurants were as varied as they could have been. They served pizza, steak, soul food, Mexican dishes, sushi, Portuguese and Vietnamese cuisine. Two were Michelin starred, San Francisco's Omakase and San Jose's Adega Restaurant. All were well-known local favorites. I loved each and every one of them. Looking over my notes and photographs getting ready to write about the trip, I noticed something interesting. In four of the restaurants, chefs had taken special notice of the flavor enhancing qualities of specialty salts. For years I have been using sea salt and additive-free Diamond Crystal kosher salt when I cook. On this trip I was impressed with the ways in which chefs used flake salts to finish their dishes. 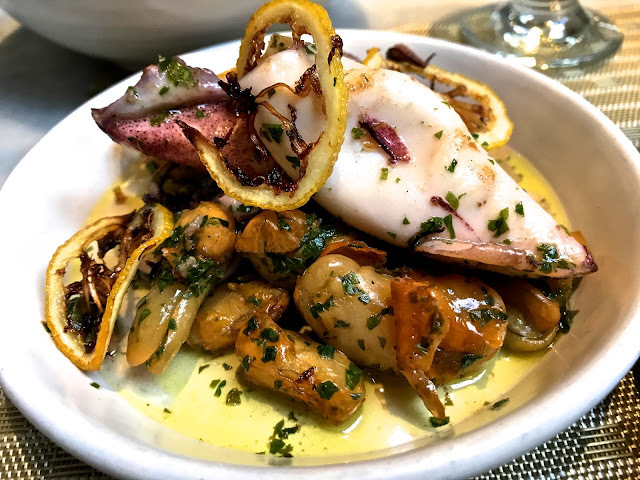 In Oakland at A16 Rockridge, as the pizzas I had ordered were baking in the wood fired oven, Isaiah Martinez, Executive Sous Chef, served me a plate of roasted calamari with deep fried Corona beans and paper thin slices of lemon. I took at bite. Delicious. Before I could take another bite, Martinez sprinkled flake sea salt on the dish. I tried another bite. The flavors were brighter and cleaner. At A16 Rockridge, Jacobsen's Sea salt is not used during cooking but as a finishing salt, sprinkled on at the last minute to protect its delightful crunch. At chef Marc Zimmerman's extraordinary Alexander's Steakhouse in San Francisco, premium steaks are accompanied with a tray of a dozen+ salts. With my steak from Hokkaido, Japan's northern most island where the weather is cold and the cattle retain their fat to keep warm, I dutifully tasted each salt. Preferring some over others. The clear favorite for me was Murray River Flake Salt from Australia. The pink salt had a clean taste, just like Jacobsen's, but with an added minerality that worked well with the rich flavors of the beef. 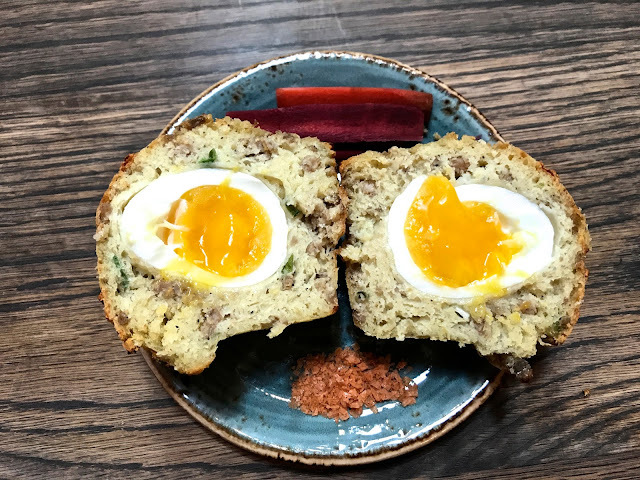 At Craftsman and Wolves, an upscale artisanal bakery and cafe in the evolving Mission District, chef William Werner creates inventive pastries and baked goods. He makes brownies flavored with Marcona almonds and salted caramel. 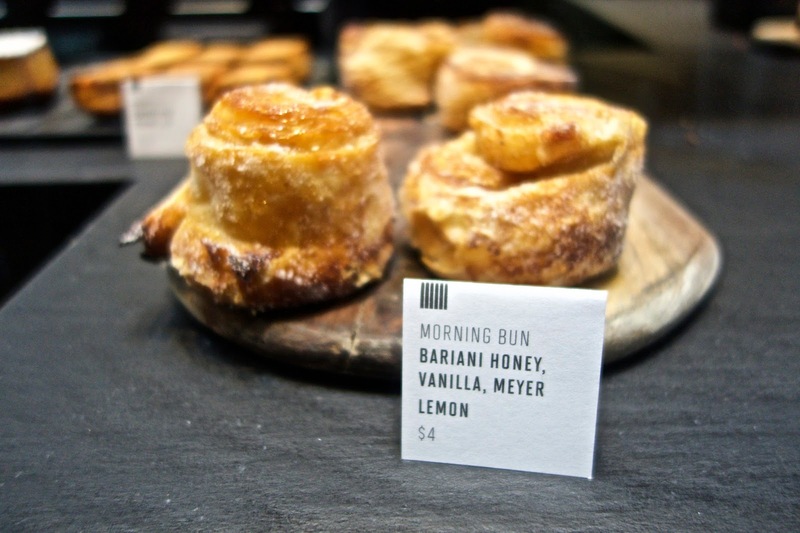 His morning buns are beautiful works of art and inventively flavored with wild bariani honey, vanilla and Meyer lemon. One of the bakery's most popular items is called The Rebel Within. Secreted inside the breakfast muffin is a whole soft boiled egg. Served with the muffin is a tabasco flavored flake salt. The crunchy, spicy salt works perfectly with the custardy egg and delicately flavored muffin. Chef Gustavo Romero Veytia created a seasoned salt because he hates waste. At Calavera Mexican Kitchen & Agave Bar in Oakland's Uptown, Veytia uses a lot of roasted tomatoes to make salsas and sauces. He found himself throwing away mounds of tomato skins that were still full of flavor. His solution was to roast the skins until they were parchment-paper-crisp before crumbling them together with Maldon flake salt. The result was a tomato salt that he sprinkles on special dishes like his Ensalada de Tomate. 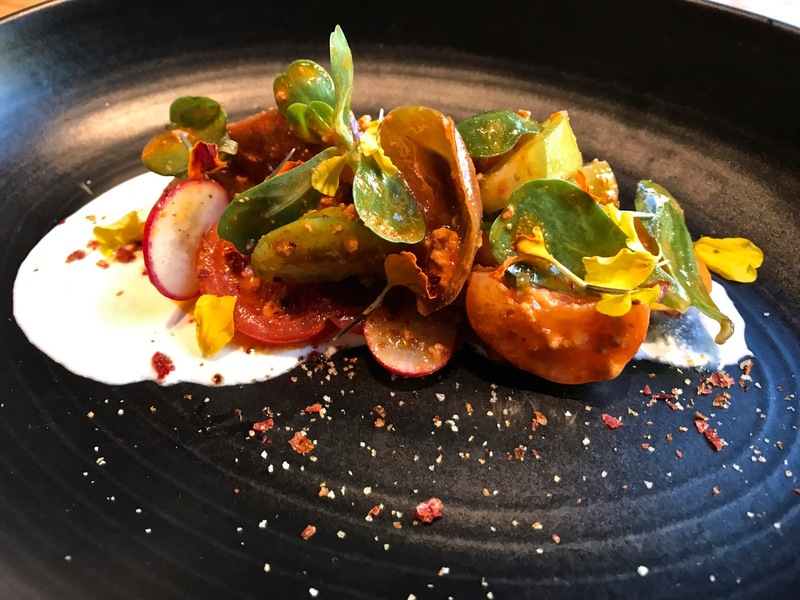 He dresses a richly flavored sampling of local summer-ripe tomatoes with a light cheese and crumbled chorizo dressing. Scattered along the sides of the plate are tomato flakes. A few of those sprinkled on a tomato and a superior dish becomes an extraordinary dish. So I could try Jacobsen's and Murray River flake salts in my own kitchen, I ordered them online as soon as I returned home. 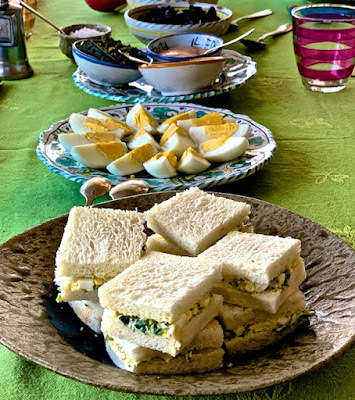 At our Sunday Pacific Palisades farmers market, I picked up all I needed to create an easy-to-make feast. I could have used the outdoor grill but I am so in love with my de Buyer carbon steel pan, I cooked the salmon and veggies in the kitchen where I could more easily control the amount of char. Even if you do not yet have these wonderful flake salts, you can have fantastic results using sea salt at the end to finish the seasoning. If you have a quality flake salt like Maldon, Jacobsen's or Murray River, all the better, but definitely sprinkle on sea salt just before serving so the salt retains its crunchy freshness. Murray River flake salt has a delicate minerality which is why it works so well with the steaks at Alexander's. Made with water harvested from Netarts Bay off the Oregon Coast, Jacobsen's has a lighter, more delicate flavor and a bit more crunch than Maldon's. Murray River does not sell its products directly online except in Australia. Jacobsen's is available directly from the company. Both are available online from multiple sources. Maldon Salt is widely available in kitchen supply stores, upscale markets and online. These salts cost quite a bit more than supermarket sea salt, but you only need a little to add a lot of flavor. All of these companies sell flavored versions of their salts. I am certain they are lovely, but for this dish, use naturally flavored flake salt. Serve with a tossed green salad, steamed rice or pasta. Mix together the two oils and set aside. Carefully check the salmon filets for bones. Remove any that might have been missed before. Using a sharp knife, create pieces 3" long and 1" wide. That size piece is easy to handle. Prepare all the vegetables before beginning to cook. Put the cast iron or carbon steel pan on a high flame with the overhead exhaust fan on. Do not add oil until the pan is hot. When the pan smokes, drizzle on a tablespoon of the mixed olive oils. 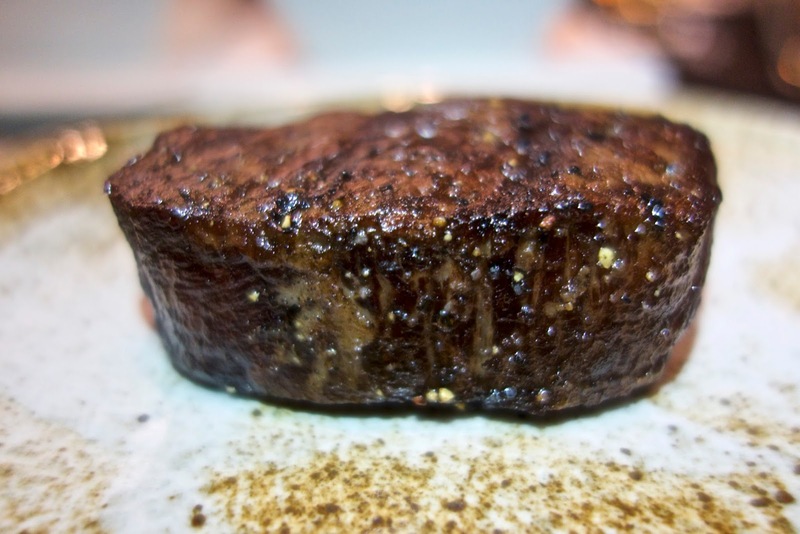 Season with a dusting of sea salt and freshly ground black pepper. Using long tongs, sauté the vegetables separately since they cook at different speeds. Start with the carrots. 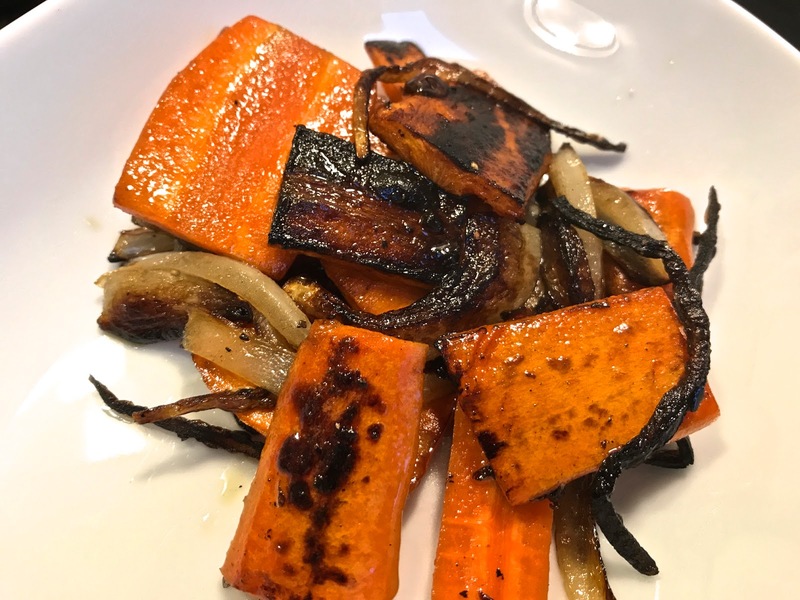 When they are charred on both sides but not burnt, remove and set aside. Do the same with the onions and mushrooms (optional). Add more of the mixed oil, sea salt and freshly ground black pepper as needed. Put the cut pieces of corn on the cob into the pan. 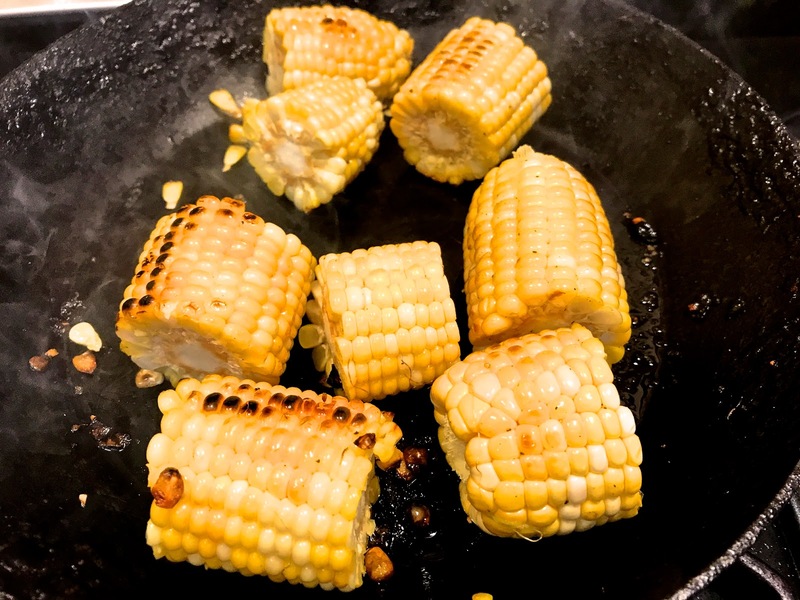 Turn the cobs in the hot pan until most of the kernels are charred. Work in batches if necessary. When all the vegetables are cooked and reserved and the rice, salad or pasta has been prepared, add a bit more mixed oil to the pan. 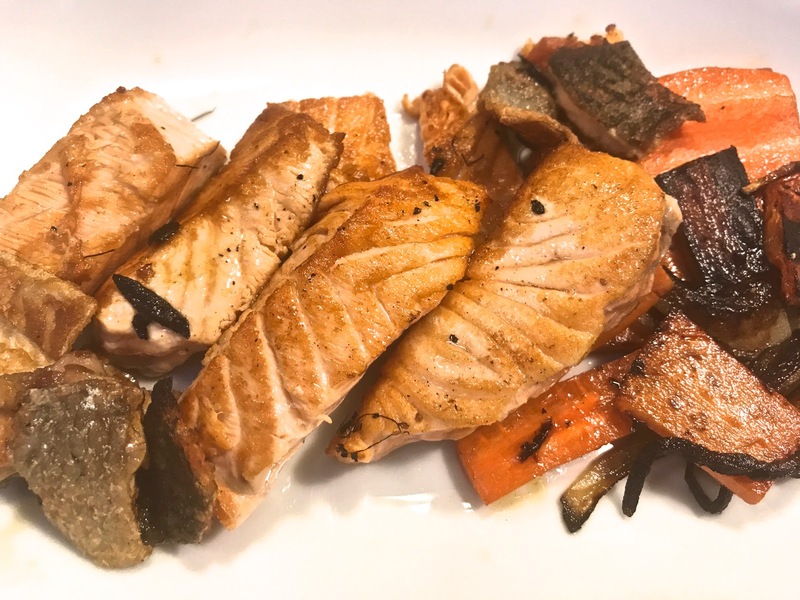 Place the salmon pieces in the hot oil. Work in batches if necessary. Turn each piece so it browns on all sides. Place the vegetables on a plate. Add the salmon. Just before serving, top with flake salt. Serve immediately.